Writing and Recognition | Does This Font Make Me Look Fat? I’ve been thinking a lot about writing and recognition, and in the process have been reading a lot about author platforms and blogging. Some experts say you need to start blogging at least three years before you publish your book. Boy, did Laura and I get that one backwards. One consistent comment is that you need to make sure you know for whom you are writing the blog. Sounds simple. However, we write a lot of different kinds of things, YA novels, screenplays for movies and TV, and last year our first play which got produced. Who the heck is our audience? Laura and I chose the name for this blog because we get so neurotic at times about what we’re doing. Since I (Mala) write the blog, I am always looking for things to write about and get confused about what the focus of the blog should be. Do I blogg only about the Santa Diaries project? The play is over and we have another theater interested for this coming December. Who knows what will happen with that. If I think about it too much, will that jinx it? If I send positive energy to the theatre, will that accelerate the process? Could I just shut down my brain? In the meantime we are polishing the movie script we wrote from the play and have our second round consultation coming up mid-August with Dara Marks. And while we are waiting for that, we just finished the spec script we’re doing for Khris Baxter. Interestingly that script is the behind the scenes story of how a famous Broadway show got produced. Researching that was a revelation. I thought our experience with the Avalon Theatre was stressful, but apparently that’s par for the course. Are we nuts to write scripts on spec? Part of me thinks, why not, I’m learning and becoming a better writer with each project…and the truth is nobody is calling us and offering us money. But another part of me thinks I could be writing that third Caribbean novel that’s been on the shelf for seven years, or Laura and I could go back to the draft of the second novel in the Big Skye Ranch series that we wrote three years ago. Maybe it’s time to be smarter about how we use our writing time – be more focused and planful. Would that be nearly as much fun? That is the real dilemma. Neither of us has to earn money doing this, so having a good time with our writing is a huge incentive. I’m not saying it wouldn’t be fantastic if we made money, but we write to satisfy other creative urges. Okay, that’s a rationalization. Would we turn down a hit movie, a best seller on Kindle, a bidding war by major publishers? Of course not! Money is one thing. Recognition is another. I suppose one of the reasons The Santa Diaries was so satisfying was the recognition we got for doing it. We live in a small town and most people knew about the play. In fact, just about everybody in town was in it. This all leaves me wondering…is there is a way to build in recognition for writing, even if the money remains elusive? Maybe it goes back to knowing who you write for. Frankly, I don’t think we’re going to figure that out any time soon. 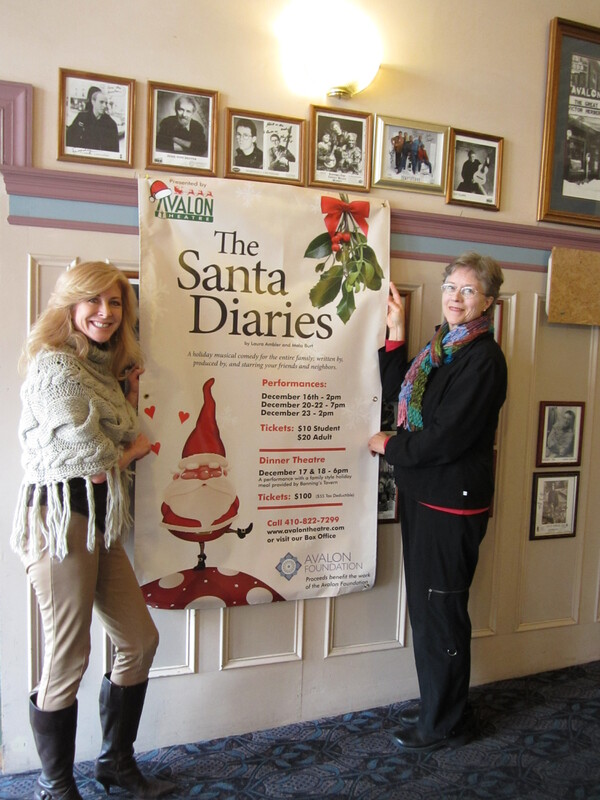 This entry was posted in Christmas, Personal, The Santa Diaries Play, Uncategorized, Writing Tips and tagged Avalon Theatre, Dara Marks, Laura Ambler, Mala Burt, The Santa Diaries by Mala Burt. Bookmark the permalink.